Microwave-Assisted Sample Preparation for Trace Element Analysis describes the principles, equipment, and applications involved in sample preparation with microwaves for trace element analysis. The book covers well-established applications as well as new trends in this field. Hot topics such as sample preparation for speciation, metabolomics, and halogen determination, as well as the alternatives of sample preparation for special samples (for example, carbon nanotubes, polymers, petroleum products), are also discussed. The use of microwaves in sample preparation has increased in recent decades. 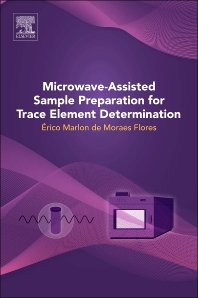 Several applications of microwaves for sample preparation can be found in the literature for practically all types of sample matrices, especially for the determination of trace elements by atomic spectrometric techniques, safely and cleanly reducing the time involved in this step. Microwave-assisted sample preparation is not only a tool for research but also for routine analysis laboratories; the state-of-the-art in sample preparation in trace element analysis. This book is the only resource for chemists specifically focused on this topic. Érico M. M. Flores has a permanent position at Universidade Federal de Santa Maria in Brazil (since 1991) and has performed research and teaching activities in the Analytical Chemistry field. He is currently a titular member of the Brazilian Pharmacopoea Commission, Director of Analytical Chemistry Division of the Brazilian Chemistry Society and coordinator of the Chemistry Commission of Foundation of Rio Grande do Sul State for Research Support, Brazil. He has experience in many fields of analytical chemistry with emphasis on sample preparation development methods, atomic spectrometry, use of microwave and ultrasound, speciation analysis and quality control of pharmaceutical products. He published more than 150 papers in these fields. He has discovered and developed a new system of microwave induced combustion (MIC) that is currently commercialized in many countries and has opened a new window in sample preparation for trace analysis. One of his main hobbies is to work in the development of new sample preparation methods using alternative systems with the use of microwaves, ultrasound and UV radiation.